CULLMAN – The Alabama State Department of Education (ASDE) on Thursday released the 2016-2017 State Report Card, part of 2012's Alabama Accountability Act, which required the ASDE to come up with a report card to assign an overall letter grade for each public school system and each public school in Alabama. Academic Achievement – A report card indicator determined based on the percentage of proficient students in the areas of reading and math utilizing assessments in tested grades 3-8 and 10. Academic Growth – A report card indicator determined based on individual students who demonstrate improvement in reading and math from one year to the next using multiple years of data. Letter Grade – The alphabetic letter assigned to a school, district or the state that correlates to a grading scale in order to give a summative indication of the school, district or the state. Alabama Act No. 2012-402 – Alabama law (commonly referred to as the “Alabama’s Report Card Law) that requires the state superintendent of education to develop a school grading system reflective of school and district performance. Chronic Absenteeism – Percent of students who missed a total of 15 or more days (excused or unexcused) of the school year. Points are based on students present. College and Career Readiness (CCR) – A report card indicator determined based on the percentage of students in the 4-year Cohort who met at least one of the CCR indicators. Full Academic Year (FAY) Students – Those students who are used in the calculation of Academic Achievement and Academic Growth. Graduation Rate – A report card indicator determined based on the percentage of high school students who graduated within 4 or 5 years of first entering the 9th grade. The 2016-17 school year was the last in which the ACT Aspire assessment was planned to be used. For years, Alabama students across the board scored lower than expected on the test, and lower on average than they did on the previous state assessment, leading to concerns that Aspire might not be properly aligned with Alabama’s curriculum content. After the results of the spring 2017 Aspire test returned to Alabama by ACT were found to contain bad data, the ASDE voted to cancel its contract with ACT for the Aspire. According to Cullman County Schools Superintendent Shane Barnette, that bad data was not corrected and was used in the scoring for the grade. The state will continue to use the 11th-grade college readiness assessment and 12th-grade work readiness assessment from ACT. Each Indicator Score will be multiplied by the indicated “Percent of Score.” The products will then be summed in order to obtain a numerical score. The numerical score will be matched to a grading scale and the resulting letter grade will be displayed on the Alabama Report Card. Student Engagement indicators on the Report Card could include extracurricular and cocurricular activities such as student government, sports, the arts, community volunteerism and others. College and Career Readiness Indicators on the Report Card could be the benchmark on any ACT subtest, the qualifying score on an AP or IB exam, military enlistment, approved transcript college or postsecondary credit while in high school, Silver Level or higher on the ACT WorkKeys, or approved industry credentials. Certain statistics about schools and systems appeared on the initial ASDE dashboard. 62.4 percent of students qualify for free or reduced meals. Economically disadvantaged students in the county system averaged seven to eight points below the system average on the Aspire. 13.9 percent of students have physical or mental disabilities. Special needs students in the county system averaged 30 to 36 points below the system average on the Aspire. 32.1 percent of students qualify for free or reduced meals. Economically disadvantaged students in the city system averaged 14 to 15 points below the system average on the Aspire. 8.0 percent of students have physical or mental disabilities. Special needs students in the city system averaged 33 to 44 points below the system average on the Aspire. “The Alabama Department of Education released the Alabama State Report Card today, containing a letter grade for schools and school systems across the state, including all the schools in Cullman County. This year’s State Report Card is simply a prototype, with expected changes to come in the future. “The majority of the report card is based on the Aspire Test, which is important to point out that the State Department has since ruled ineffective and discontinued its use already. But the results that we’ll be talking about today are based on that test, that we no longer use. “The State of Alabama introduced the Alabama State Report Card so students, parents, taxpayers and others could easily understand how their schools are performing; and just as report cards help parents understand how their children are performing, these report cards help the parents understand how the schools are performing. 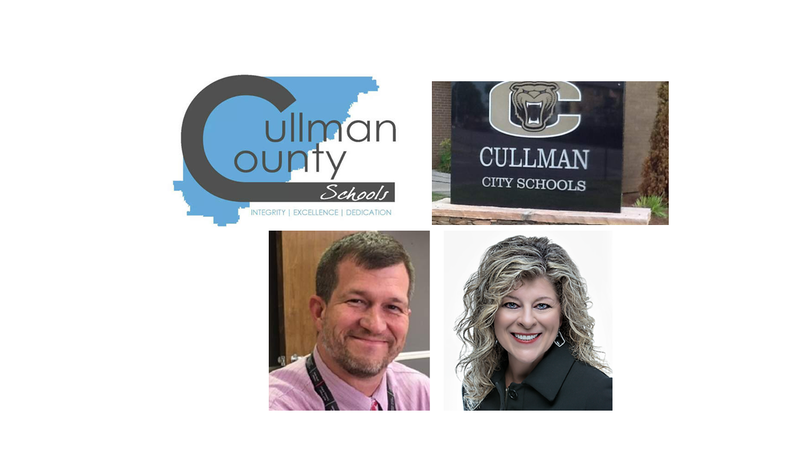 “Alabama as a state received a letter grade of a ‘C,' and Cullman County Schools has received a ‘B,’ which reflects several different factors including academic achievement, academic growth, chronic absenteeism, as well as graduation rates and college and career readiness for high schools. Every student in our system is included in the data regardless of exceptionalities or challenges. We take a lot of pride in educating all of our students regardless of these individual challenges. “Schools within our school system received a wide range of scores. Due to various grade level makeups of schools in Cullman County, many of their scores were determined by only a few indicators or maybe even didn’t even have a score, much like Good Hope Primary. They had none of those indicators in their school, so they were not even assigned a grade. I am confident that Good Hope Primary would have helped our overall score in our district if they had have gotten a grade. And that’s one reason that (this version of the Report Card is) a prototype, and they’re looking at changes, and they’re welcoming changes from the public and from educators about things they can do to help this Report Card mean more than it currently does. “Someone may ask, ‘Does a low grade mean that my school is bad?’ There are many factors that influence the quality of a school. The letter grade is simply a snapshot of how a school or school system performed during the previous year. The grades will be used to identify areas that are performing strongly and areas that need improvement. “Yes, when you see these grades–I mean they’re painful for me to look at, especially knowing the great things that are going on in the schools when I go out there and visit every day. At the same time, I take it personal because these scores are a reflection of our leadership; and that starts with me, and secondly starts with our Principals. Over the last couple of weeks, the schools have been holding data meetings to discuss the areas of need and ways that we can improve those, and ways that we can target those areas. “The letter grade is a snapshot of the school and a conversation starter for communities. It’s not about pointing fingers. It is intended to be a catalyst for discussion and improvement. Together, we will continue to identify ways that we can provide our students with the best educational experience possible. “The graduation rate for this report card is based on the graduation rate for the 2015-2016 school year. As a district that year, our graduation rate was 85 percent, fairly high when you compare it to several of the other graduation rates in Alabama. I’m proud to say that, as of last year–for the 2016-2017 year, our graduation rate was the highest ever: it was at 92 percent. So as you can see, even though this Report Card comes out today, we’ve already improved in a lot of areas from this data. Once again, this data is based on an 85 percent graduation rate, and last year we had 92 percent. Every one of our high schools last year was in the 90’s. We had anywhere from a 91 percent graduation rate at one school, to a 95 percent at other schools. So I’m really proud about what we’re doing in that area. “While we are not satisfied with our scores, we accept them. We have many exciting things happening in Cullman County that are not measured on this Report Card. Almost daily we have students and teachers, and schools earning awards or recognitions for their accomplishments. We have a really good school system and it’s getting better every day. Just this week, we had a school recognized as a School of Excellence again, for all the AP exams that they have students taking and passing, and we’re really excited about that. “Some of the things that we have going on, that are not measured on this Report Card: we have athletic teams that are winning state championships, we have academic teams that are consistently winning state championships and competing at the National Level, band students earning state level awards, multiple Blue Ribbon Schools, a Leader In Me Lighthouse School for Leadership. We have a US News-rated Top School in our school system. We have an A+ School of Excellence school, based on their AP exams that I mentioned earlier. We have an INSPIRESS Team that will be going up at the end of this school year to Washington D.C. to be presenting to NASA about some projects that they’ve done, because they won a state competition. We’re real excited about that. We have FFA quartets that are ranked third in the nation. We have CATA teams that are winning state and national competitions. We have Certified Outdoor Classrooms, and we have students that are being recognized as National Merit Semifinalists. We have partnerships with businesses and industries, and Wallace State Community College, and the list goes on. “We also have many students that face a list of challenges from homelessness, poverty, mental and physical disabilities; we have broken families, victims of drug abuse, and early parenthood. While these may be challenges, they are not crutches for the students of Cullman County. If the student is willing to try, our educators will try multiple strategies to help them become successful and overcome any obstacle. We have faculty and staff that have stood in the gap for children that range in age from Pre-K to 12th grade, to give them a fighting chance to break that cycle of poverty. This may include providing food or clothes, many times providing money, school supplies, a warm home, and many times just a shoulder to cry on. And none of those things will show up on a State Report Card, but we’re going to continue to do them, because that is what makes Cullman County great. “Our students become the backbone of our society. Our past students include homemakers, farmers, mechanics, plumbers, builders, doctors, sheriffs, state representatives, judges, reporters, engineers, lawyers. We even have a Fortune 500 executive that’s graduated from a Cullman County school. We have many teachers and principals, and we even have a superintendent that attended a Cullman County school. And the list continues to go on. We have people that are going to our schools and becoming successful contributors to our society, and we’re excited about that. “The A-F Report Card was designed by the Alabama State Department of Education to meet the requirements of Alabama law. As with any measure, our focus is on how we can provide continuous improvement for our students and schools. Just as no one single measure can accurately report everything about a student, there are multiple ways to assess the successes of a school or school system. We are very proud of the many different accomplishments our students and teachers make on a daily basis, in academics, arts, and athletics. “Along with these areas we also value the support of our community and parents, it is the collective efforts of everyone that will ensure the future success of our students. “An additional area measured by the A-F Report Card is chronic absenteeism. Attendance is an area where the supports around our students impact their performance. Daily presence is critical to success in learning, and this is an area we have taken a renewed focus on, by working with parents and others. Our school board approved our upcoming school calendar last month so that families could make plans for family events based on when students would have breaks in the school year. The intent of approving this as early as possible was to provide everyone plenty of time to make their family plans in a way that would least require students to miss scheduled school days. “The majority of the report card scores came from our student performance on the ACT Aspire, which is no longer being used by the Alabama State Department of Education. This is why our focus is always on teaching and learning that continually improves because the standardized assessments and instructional standards change every few years. The ASDE Report Card dashboard can be viewed at http://ap.alsde.edu/accountability/EducationReportCard/selectschool. View Barnette's press conference at www.facebook.com/CullmanTribune/videos/1628957897165899/.